I've been trying to blog once a week this summer. Since the last time I wrote here, I started two summer jobs! So life has started to become busy again. Today I asked my boss if I could work at home instead, so it was kinda like a day off for me. So I baked. I've been spending alot of time flipping through my cookbooks and thought that cream puffs might be a good idea since I haven't had one since last summer! 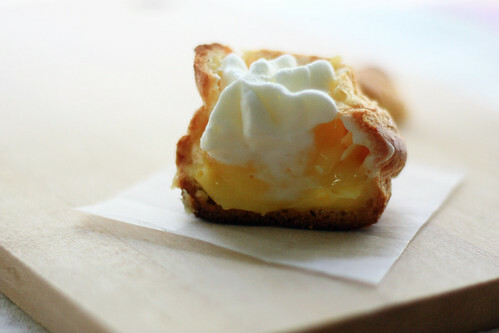 I chose the lemon cream puffs because it isn't a flavour that is offered at Beard Papa and it is a very summery flavour, perfect for the 30C+ temperature in Hong Kong right now. 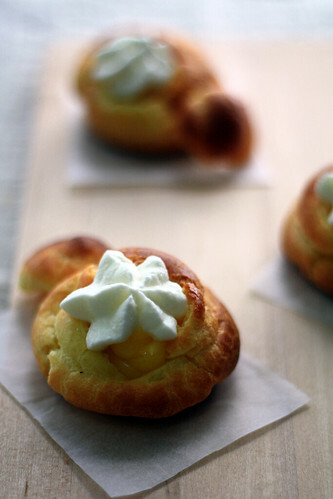 These puffs are made of choux pastry spiked with some lemon zest, and there are two fillings inside - lemon curd and sweetened whipped cream. This is my first time making lemon curd and it's pretty similar to making the custard for ice cream! I'm glad that I didn't end up with any scrambled egg bits. However I found it to be a bit tart from my liking and my sister thought that it was a tad too buttery. I think I would prefer a meyer lemon curd, but I don't think any grocery store in Hong Kong sells them! 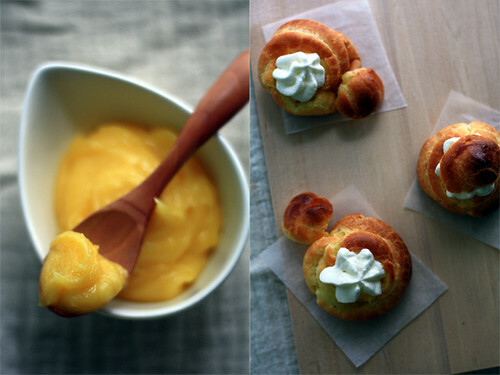 Nevertheless, the whipped cream helped balance out the tartness of the lemon curd so the cream puff was still a delight to eat! I still haven't mastered how to make the choux pastry bake up really nice and crispy, so it was not as crunchy as I liked it to be. NEW! My Buttery Fingers is now on Facebook! Method for making the choux pastry is same as the one here, add in the milk with the water and stir in the lemon zest last. Oven times and temperatures are the same. Whisk together the eggs, yolks and sugar in a small saucepan. Heat over medium heat, whilst stirring until the mixture thickens slightly. curd over an ice bath, stirring occasionally. Cut off the tops of the puffs, around 1/3 from the top. Pipein the lemon curd using a plain tip. Using a star tip, pipe a small mound of whipped cream on top. 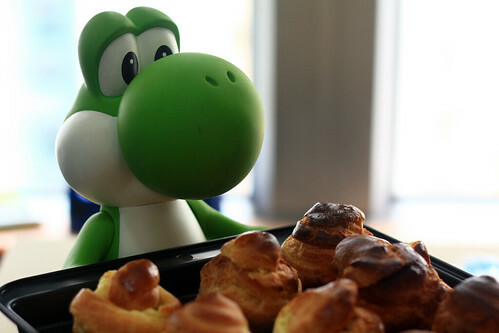 Serve immediately or the shells will become soggy. These look amazingggggggggggggggg. i'm salivating right now hehe.